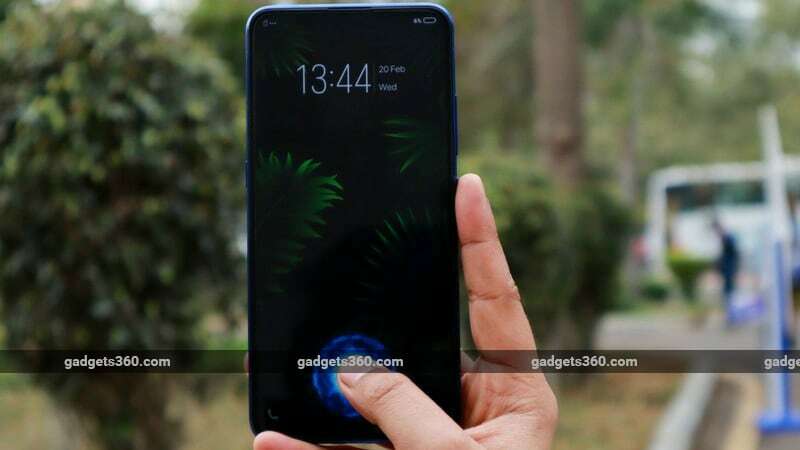 Vivo has launched its much-hyped smartphone with a pop-up selfie camera, the Vivo V15 Pro, in India. The Vivo V15 Pro offers an appealing design plus in-demand features such as an in-display fingerprint sensor and a triple rear camera setup as well as its innovative pop-up selfie camera. All this comes to India a price of Rs. 28,990. The Vivo V15 Pro will be available offline and on online stores including Flipkart, Amazon, Paytm Mall, and Vivo’s official e-shop starting March 6. Vivo has launched the V15 Pro in Topaz Blue and Ruby Red colour options. We got a hands-on experience with the new Vivo offering at the launch event, and here are our first impressions. The Vivo V15 Pro has a svelte design with thin edges and it feels solid in hand. The rear panel of the Topaz Blue variant has a beautiful gradient finish with a dot-like texture in the centre that gradually fades into a pattern of wavy lines towards the edges. The look is attention-grabbing, and despite its plastic body, this smartphone is not very slippery. On the flip side, the glossy rear panel picks up smudges and dust particles really quickly. The right side has the power and volume buttons, while the left has a dedicated Google Assistant button and the microSD slot. A 3.5mm headphone jack and the pop-up camera are on the top, while a speaker and the SIM card tray (Nano + Nano) are on the bottom. The Vivo V15 Pro packs a 6.39-inch Super AMOLED display. We were pleased with the notchless design and the slim bezels all around, which give the device a minimalist feel. It seems better suited for videos and games than displays that have notches. In our limited time with the Vivo V15 Pro, we found the full-HD+ (2340×1080 pixels) display to be vibrant, exhibiting the punchy hues and deep blacks typical of AMOLED panels. We also found the display to be a bit reflective, but we’ll reserve our opinion for our in-depth review of the new Vivo smartphone. The Vivo V15 Pro is powered by the octa-core Qualcomm Snapdragon 675 SoC paired with 6GB of RAM and 128GB of storage, which can be expanded using a microSD card (up to 256GB). It has a 3700mAh battery and supports fast charging. The device runs Funtouch OS 9 which is based on Android 9 Pie. In our brief time with the smartphone, we found it to be snappy. Apps launched quickly, multitasking was lag-free, and animations were smooth. There are a tonne of pre-installed applications, though. 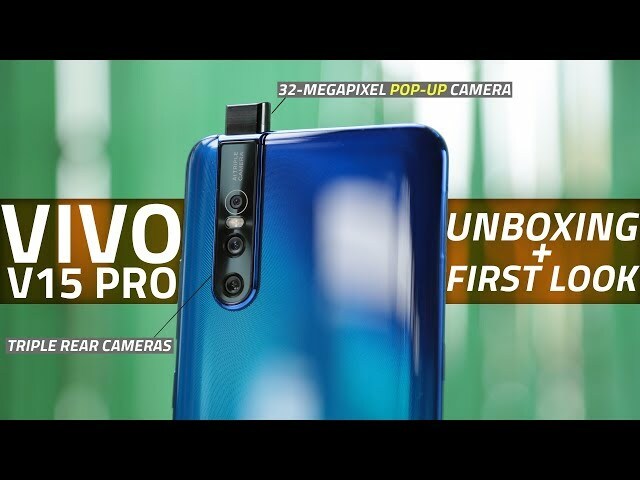 The Vivo V15 Pro comes equipped with three rear cameras, including a 48-megapixel primary sensor, an 8-megapixel wide angle sensor, and a 5-megapixel depth sensor, all encased in a vertical module that creates a prominent hump on the back. The signature 32-megapixel pop-up selfie camera is aligned with the triple camera module. There are a lot of camera features to play with in the camera app, such as slow-mo video recording, 4K video capture, night mode, portrait mode, and AR stickers, among others. We’ll test the quality of all four cameras in our full review. The Vivo V15 Pro seems to offer capable hardware at Rs. 28,990, but is that enough to beat the competition? Stay tuned for our full-length review of the Vivo V15 Pro, in which we’ll examine its specifications, features, construction quality, display, performance, cameras, and battery life, to find out.